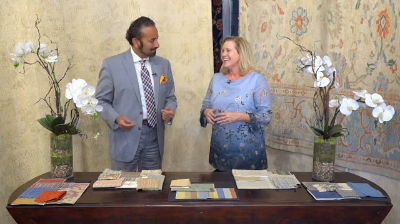 Watch on Design Santa Barbara the process of a project with Leesa Wilson Goldmuntz and your host Michael Kourosh. On this episode of Design Santa Barbara we are proud to welcome Leesa Wilson-Goldmuntz. We hope you enjoy this new season starting with Interior designer Leesa and your host Michael Kourosh. See how they explore a selection of rugs with the help of Leesa’s story boards to help you see the contrasts. Along with the similarities needed in creating a well balanced space. Leesa has a disciplined eye to details and an exceptional eye for design. Leesa’s Projects range from new construction and remodels, to completing or refreshing existing spaces. Including space planning, materials selection, custom lighting, case goods, furnishings and art. Using the basic elements of good design and a respect for budget allows Leesa to help clients achieve a result that reflects their personal style and suits their specific needs. See the most outstanding rugs that Leesa Wilson-Goldmuntz chooses from Rugs and more. One of which being a beautiful “Ziegler & Co Sultanabad” that Leesa uses for her design. Along with a wonderful contemporary style “Leesa Organic rug” created by Leesa Wilson Goldmuntz her self. It is hand woven with the highest quality hand spun wool from highlands and organic all natural dyes. We have used all the colors of the rainbow in subtle and short stripes. These colors work to accentuate a room’s natural light and the surrounding furnishings, bringing warmth from woods and making colors more vibrant. The fantastic weave and texture bring a modern feel to any room along with an Montecito Oushak rug that has become the rug of choice for many of the top interior decorators in the world today. Made of natural dyes and hand-spun with wool. These rugs are meant to tie rooms together in a home to make sure that when you walk into any living space it all flows. 8×10’3 The Oushak rugs have become the rugs of choice for many of the top interior decorators in the world today. Made of natural dyes and handspun with wool. 8’5 x 8’4 Leesa Wilson Goldmuntz created this beautiful transitional rug. It is hand woven with the highest quality hand spun wool from highlands and organic all natural dyes. We have used all the colors of the rainbow in subtle and short stripes.